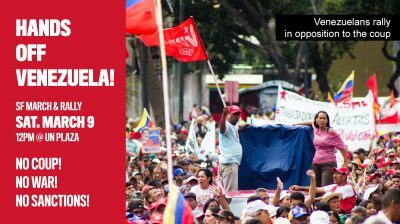 Join us on March 9 for a march and rally against the Trump administration’s effort to engineer a coup in Venezuela and a new devastating war there. The aggressive policy against Venezuela repeats the ugly pattern of wars for regime change in the oil-rich countries of Iraq and Libya. Bolton has made it clear that the objective of the imperialist offensive is overthrow not only the government of Venezuela, but also those of Cuba and Nicaragua. Trump has repeatedly stated that the “mistake” of Washington’s wars in the Middle East is that “we didn’t take the oil.” Venezuela has the largest proven oil reserves in the world. U.S. hands off Venezuela — U.S. Hands Off Latin America! The San Francisco action will be held in conjunction with the National March on Washington on March 16.